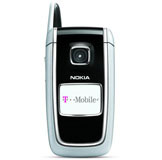 T-Mobile USA launched the Nokia 6101 today. The 6101 is a mid level flip-phone and by our count is the first Nokia flip phone to get mass market distribution in the US. The 6101 is also being sold for pre-paid service through T-Mobile To Go though pricing is unknown at this time. Expect to pay $149.99 for the 6101 with a service contract.